Hey everyone! This post will be much less wordy and a lot nicer to look at. It was beautiful here today, and the perfect time to get some outdoor photos. Enjoy! In the past few weeks, PeTA has been taking online heat going after Steve Irwin, a man who many of us in this hobby relate to. I do enjoy seeing this and people rallying around the idea that PeTA is awful. But, we have to do more than just post some memes. This brings me to the main concept of this post, USARK. Whether you have one Leopard Gecko or a building full of Reticulated Pythons or anything in between we are all in the same boat. PeTA and other groups like them view all of us, dog lovers, zoo keepers, etc. the same way they view Steve Irwin. Don’t let those TV commercials with the sad songs fool you. As someone who does this for a living, I spend every day cleaning, feeding, watering, and caring for the animals in my collection. Every day all day. I love being able to do this and cannot imagine a time when it would be impossible to do so. Thus I fully back USARK and donate a portion of every animal sold to their work. I am in no way saying you have to do that, but whatever you can, that anger you feel towards Peta, make sure you are doing something that really counts. Become a member, donate an animal to a USARK auction during a Reptile Expo. Anything helps our cause. My small breeding company has invested in cage manufactures, rodent suppliers, shipping companies, and on and on, so it is also important to us that we help those fighting on the front lines. Phil Goss, the President of USARK and his team do an incredible job with the daunting task of fighting these anti-animal bills. We owe a lot to them, but the fight NEVER ends. For this post we just want to talk about a simple but powerful gene which we believe has a bright future ahead, and that is the Matrix. We will go over the basic characteristics of this gene, how it works genetically, and the combinations of Matrix along side other genes. To the untrained eye, Matrix can look very similar to a normal but there are a few things to look for. The most definitive characteristic is a pink tongue. Normals have a dark/black tongue while Matrix do not. Other identifiers included pixelated side patterns and a wider than normal sub ocular stripe. As with all things Blood Python there will be a wide spectrum of looks. Pictured is a nice Matrix with some dorsal striping. 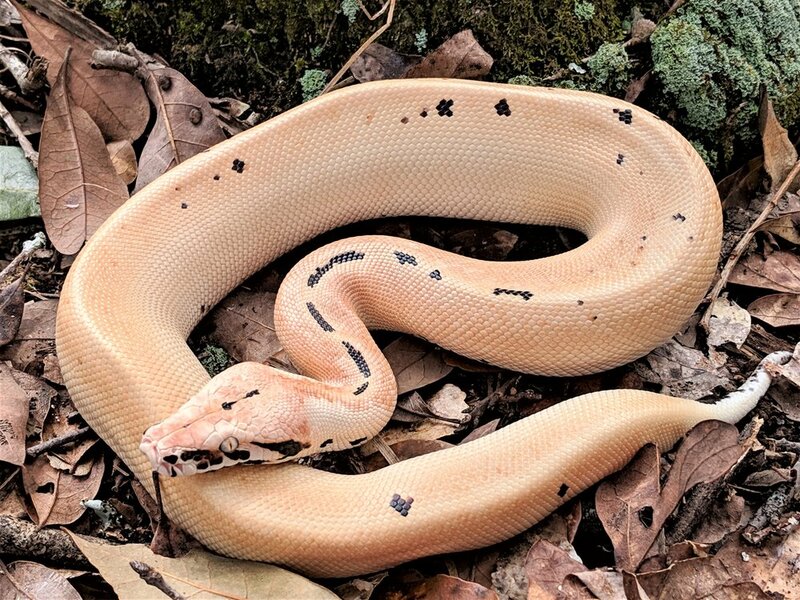 These sometimes can be hard to pick up on unless placed next to a normal, so if you are looking to get a Matrix in your collection it is best to buy from an experience Blood Python breeder. They will be able to tell them apart from other clutch mates. Matrix is the incomplete dominate form Ivory. Or Ivory is the super form of Matrix. This means that when Matrix x Matrix is bred 1/4 of the offspring will be Ivory, 1/2 will be Matrix, and 1/4 will be normal. Matrix x Normal, half the clutch will be Matrix and half will be normal. Ivory x Matrix will result in 1/2 Ivory and 1/2 Matrix. However that is just the beginning when it comes to Matrix. The Batrix, or Batik Matrix is a great looking snake. The Matrix intensifies the broken pattern of the Batik making it look like the pattern on a Granite Burmese Python, (only better in our very biased opinion!). Here is an example of the Batrix. Another incredible combination using Matrix is the 007. A 007 is a Golden Eye Matrix. The matrix has a dramatic impact on the Golden Eye from both a color and pattern aspect. They are very unique looking animals as you can see here. One of the more unique things we have done with the Matrix gene is breed it into our CBE Stripe Line animals. We did this last year and though the clutch was small the results were outstanding. The Matrix again showed to be a pattern changer to the stripe. Here is a picture from that pairing. Last but not least, is the Electrostatic (Ivory Batik T+ Albino) we produced last year. All we did was take three genes that have been around for a long time and create something mindblowing. The three genes compliment each other so well and this snake shows why we believe Matrix is the cornerstone for many projects going forward. What isn’t there to like about Matrix? The Electrostatic is just one of many reasons why we also LOVE to add in T+ Albino into our Matrix projects. This is an overview of the Matrix gene, if you have any questions about this, please do not hesitate to reach out. Just wanted to get some thoughts down. Hope you will enjoy the read. There are lots of new people coming into Blood and Short-Tailed Pythons which is great! This group of snakes make very rewarding captives and have come a long way in the last 20 years. They have so much to offer from purposefully bred normals to level up morphs. We will get into the meaning of those descriptors in a bit. With the recent interest in these animals more of them are being produced and some incredible things are being done with them. But it is important to think beyond just the price tag. 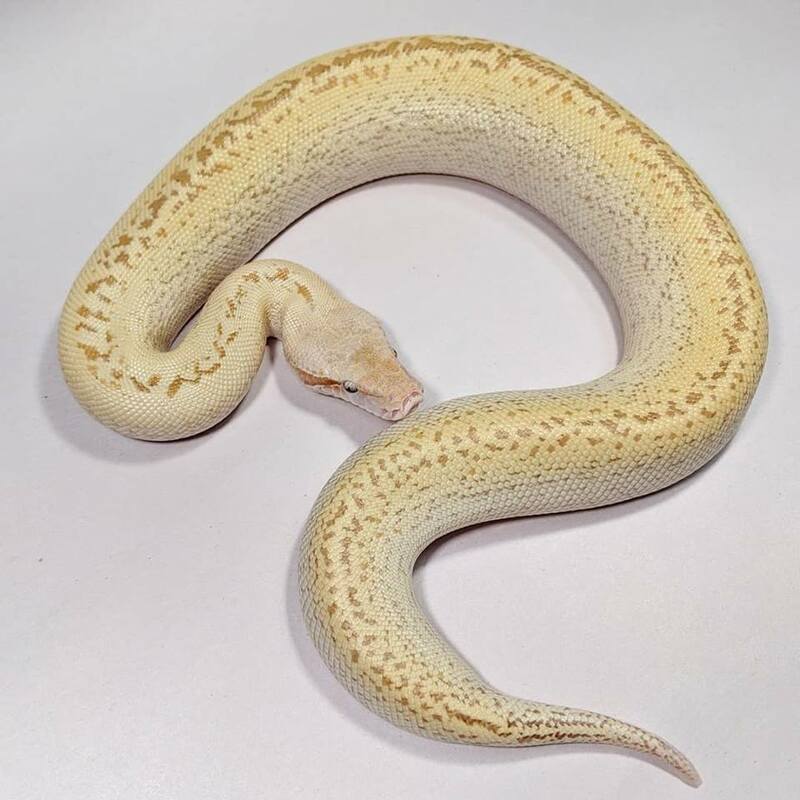 When you are looking for a new addition price is just a small factor when considering bringing a new animal into your collection. A lot of factors go into pricing these snakes. Can the breeder provide parent pics? Can the breeder explain why those animals were paired together? Does the breeder answer questions in a reasonable amount of time? Reachable for questions as they arise? Does the breeder have a Vet to monitor the health of their collection? This list could go on and on. We work very hard on these things and are continually making improvements. Our goal when pairing these animals is to create offspring that move the species forward in terms of color, temperament, and hardiness. If we believe the offspring will be better representations of their parents, we will breed those animals together. None of our pairings are done just because. If you look at our growing collection you can see this play out in real time. It has taken us 10+ years to get to this point and be able to offer up some gorgeous animals, and we are going to continue to push on with each generation. It did not happen overnight and it wont happen by just throwing animals together without a vision. Your vision does not and should not be ours. It is all about what your goals are. Think long term, not just “how much money will this clutch make me”. That's a recipe for failure. This is where “purposefully bred” and “level up” come into play. Pair with a purpose, hatch animals that level up your collection. Buy that dream animal of yours from someone that gets this idea (doesn't have to be from us, but we will be happy to help you if that's the case). What does all this mean? Well, sometimes our animals are a bit more than other sellers. At this point, we hope you see why. We do not believe to chasing the lowest common denominator. This is not a long term strategy for us or for YOU. We want you to be successful if and when the time comes that you sell offspring from animals you purchased from us. We believe that supporting what you like and who you believe in is very important. That is why we take what we do very seriously. These animals live a long time, so grab something that wows you every time you look in their enclosure. Here is a real life example just to show that we aren't just talking the talk. 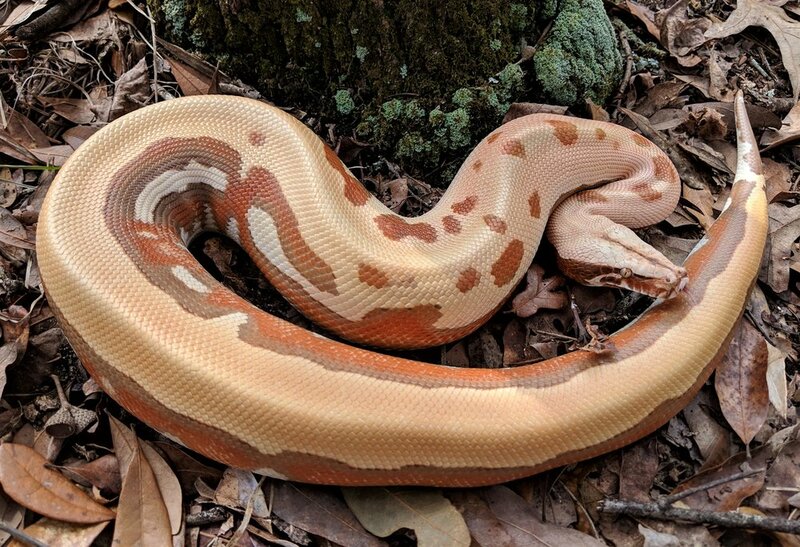 in 2009 we purchased a pair of adult Matrix het Albinos for 12k. Yes, you read that right. Now the price of Matrix is much lower but what is important to realize is that this pair of snakes have produced incredible animals for us. 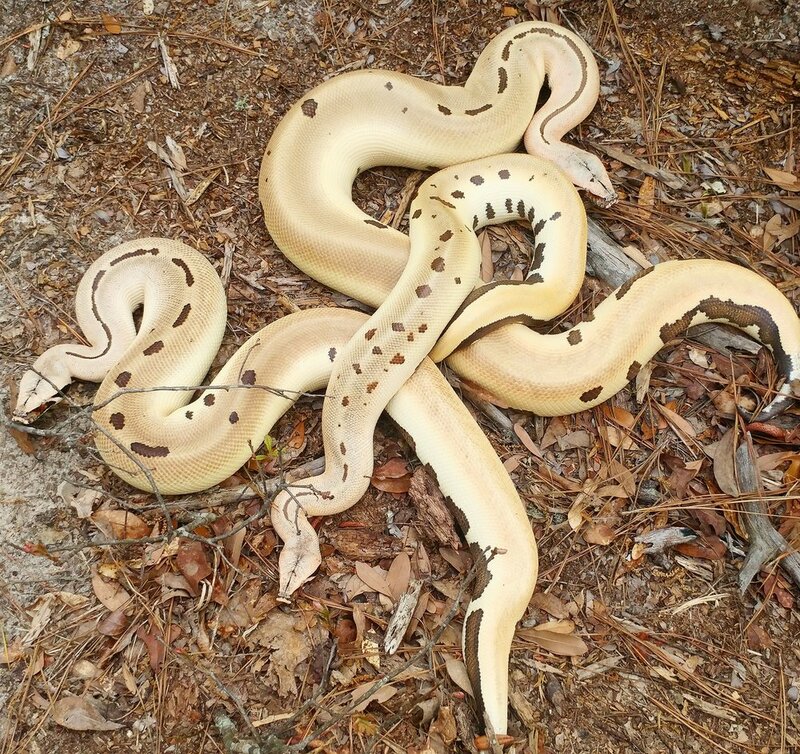 Including Albino Ivorys and the Female Matrix het even produced the first Electrostatics (Albino Ivory Batiks) for us last season. Pictured below. Moral of this story is, even if you invest in an animal, and the price goes down season after season, it does not make your animal have any less value. The important thing to do is breed with a purpose. Lastly we just want to say a big thank you to everyone who has supported us throughout this journey. We could not do any of this without you all. Feel free to reach out to us anytime to discuss this further or any other aspects of Blood and Short-Tailed Pythons. Sorry for the long time in between posts. Busy, busy around here but all good things! We are coming up on egg time, with two clutches on the ground as we speak! That about rounds it up so far this year. We are still getting a few locks but this what we expect to have offspring from later this spring. If any of these pairings are of interest to you, send us an email, nickbottini@coldbloodedearth.com. Okay so you have spent the time searching for your new Shortie and decided to get one from us. The next step is getting your new addition to you safely. Shipping is the most stressful part of the whole new purchase thing, especially for the excited new customer. We've shipped a lot of animals over the years, and this is how we do it. Hopefully it cuts down on the anxiety shipping can cause. We do not ship animals when day time highs are above 90 degrees or below 35 degrees. The well being and safety of the animal is the most important thing to us. Waiting a few extra days or weeks to get your animal alive and healthy is worth it. Trust us. First, lets start with the actual shipping box. We use new boxes everytime and a minimum size of 12 x 9 x 6. Yes, even for hatchlings we use this box. The larger space allows for more air flow, especially when heating packs are added. Heating packs use oxygen during the chemical reaction that makes them warm, so air flow is a MUST. The shipping boxes are insulated with 3/4" foam. This makes the box very rigid and safe from rough handling. 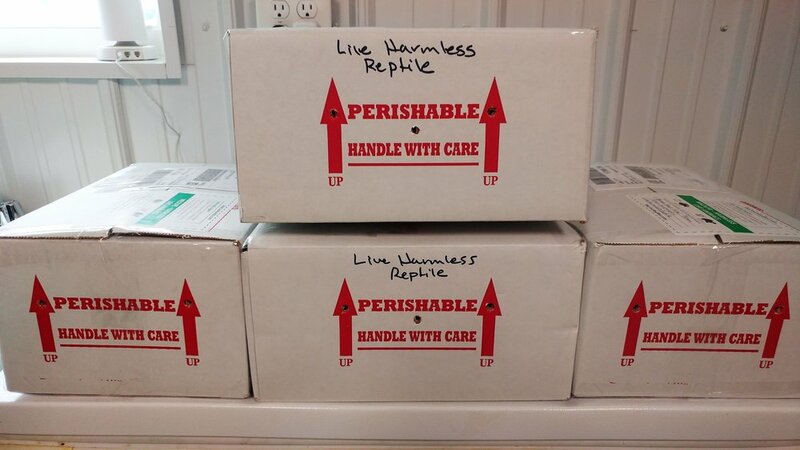 The boxes are also labeled with the contents and marked live harmless reptile. Your snake is placed in a cloth bag with a paper towel and laid in a thick layer of news paper. We use shipyourreptiles.com to put our shipments together and they are insured. Shipyourreptiles.com is just another good safety measure and they will keep their site updated for delays or other possible problems. I have shipped almost 200 separate shipments using their services and I have been very happy. SYR customer service is great. They use FedEx and most shipments arrive by 10:30am, but if you are in a remote location that time can be 12-4pm. Delays and problems do happen, it is just the nature of shipping anything. However with how we ship animals we have had almost no problems. Recently we had two separate West Coast shipments get delayed, one of them for 2 extra days and the animal still arrived safe and sound. We contribute this to the larger box sizes, as well as using 60 hour heat packs. Shipping animals this way is not a cheap thing to do. New boxes and over night service are pricey but we do not make a penny on the shipping costs and it is worth every cent to go above and beyond to make sure the animals are safe. The most important thing is the well being of the animal. Below is a picture of a few animals we sent out recently. You can see everything is clearly labeled and there are air holes for extra ventilation. Sorry for the long delay between posts! My wife and I just moved into our new house, and between packing up and trying to get settled it has been more than hectic. I also left my day job as a Herpetologist at a zoo here in SC to follow my dream and do the snake breeding thing full time! I will tell you, I am really excited to start this new venture and could not have imagined doing it without the full support of my wonderful wife and family, and all of you! Really is a dream come true. Anyway! On to the important stuff. We recently hatched out a clutch from Golden Eye x Batik het T+ and had some pretty unexpected results. Check out the pictures below. There is a normal, GE, Pixel, and two odds balls, one being a runt. They are all eating well! I am not sure what is going on here, however there may be another gene at play. It is too early to tell but we are looking forward to seeing what this project has to offer. Even the normal is a bit different, so we will be raising this entire clutch up. We cannot wait to see these animals grow and change. Stay tuned for more updates of them and other things happening here! I was just going through some pictures and wanted to share of few of them with you all. These are pythons from various clutches all getting there first view of the world and taking their first breathes. This part of the breeding process is the most exciting. I still feel the same way when I see heads poking up out of the egg that I did with my very first clutch. It is a long and tedious adventure from cycling the adults, pairing up animals, pulling eggs and getting them in the incubator, the 60 days to hatch and all the while just imagining what is in each egg. This is what it is all about! It is an incredible experience to get to see new life emerge right before your eyes! Hope you enjoy these pictures. We just wanted to do a quick update on this years breeding season. Our last clutch was laid this week 6/3/17. 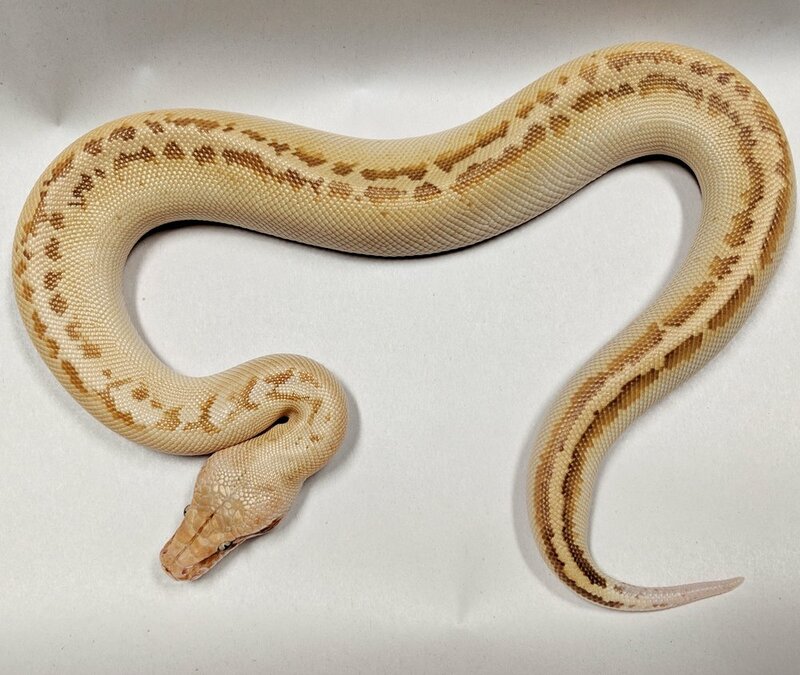 It was Female VPI Stripeline Hypo possible het T+ Albino x Golden Eye 100% het T+ Albino. We are thrilled about this pairing and cannot wait for the 60 days to be up. Below we have listed all the successful pairings we did this year. As animals begin to hatch and start eating, anything available will be listed in our Shop. Please feel free to contact us with any questions or interest you may have. We often take a lot of pictures and only end up being happy with a few of them. These snakes are notoriously hard to photograph so we are constantly playing with backgrounds and the right lighting. Having said all of that, here are a few from this week we are happy with. Enjoy! This girl is one of our favorites. We produced her by breeding our CBE Stripe Line founder to a VPI Stripe Line hypo. Racks: Why we use them and NO it is not animal abuse! Welcome to CBE! We have recently re-done our website and on this Blog page we will be posting updates as they happen. Photos, egg laying, hatchlings, any news, and shows we plan to do will be posted here. So to kick it off, here is a picture from out first clutch of the year! From top to bottom, 100% het T-, Matrix 100% het T-, and 007 100% het T-. We look forward to keeping you up to date on our activity here at Cold-Blooded Earth!